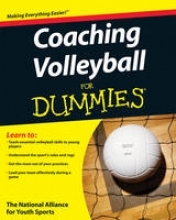 Coaching Volleyball For Dummies teaches the fundamentals of volleyball and contains the proper progressions to help players master and apply their skills on the court. Part I: Getting Started Coaching Volleyball. Chapter 1: Teaching Volleyball to Children. Chapter 2: Building a Strong Foundation for a Successful Season. Chapter 3: The Rundown on Basic Volleyball Rules. Chapter 4: Getting in Sync with Your Players Parents. Part II: Building Your Team. Chapter 5: Overseeing Your Team. Chapter 6: Running Fun Filled Practices. Chapter 7: Making Game Day Memorable For the Right Reasons. Part III: Basic Training: Teaching Volleyball Fundamentals. Chapter 8: Racking Up Points with Offensive Fundamentals. Chapter 9: Developing Defensive Fundamentals. Chapter 10: Fundamental Drills for Beginners. Chapter 11: Refi ning Your Coaching Strategies. Chapter 12: Taking Your Drills to the Next Level. Part IV: Net Gains: Zeroing In on Advanced Volleyball Skills. Chapter 13: Revving Up the Offense. Chapter 14: Bolstering the Defense. Chapter 15: Stepping Up the Offense. Chapter 16: Tightening the Defense. Chapter 17: Keeping Your Players Healthy and Injury Free. Chapter 18: Dealing with Common Coaching Challenges. Chapter 19: Coaching a Club Team. Chapter 20: Ten Ways to Make the Season Memorable. Chapter 21: Ten Ways to Help Players Take Their Game to the Next Level.